I’ve been trying to get some code running on my Pi 2. The code has been ‘problematic’ to get working, and I’m running into frequent hangs on the Pi where I cannot initiate a new SSH or console session. It’s also complicated because the Pi is outside in the garage (I have a GPS hooked up so it needs some visibility of sky). That means that every time it hangs I have to head out to the garage, pull the micro USB cable, reinsert it and then start the whole ‘Edit, Compile, Run, Head out to the garage to Reset’ cycle again. Anyway, in an effort to simplify things I was looking around for a way of remotely resetting the Pi without having a connection to it. I found a ton of sites talking about the P6/RUN header on the newer boards, but this was mostly just about adding pins to short out with a jumper or adding a momentary switch to do the same. What I wanted was something more like connecting an Arduino pin, or a pin from another Pi to the P6/RUN on the target Pi and forcing a reset that way. What I wanted was a “Raspberry Pi P6 Reset Hack” – unfortunately AdaFruit don’t sell a kit for that. Putting together a small app to force the GPIO0 pin low for a few milliseconds and then high again. Now when my target Pi hangs I can just ssh into the watchdog one, and run sudo ./reset-app and the target Pi reboots. This is a QuickAndNasty™ solution. I am not responsible for any damage to your Pi, your electrics, your health or anything else – anything you do as a result of reading this is at your own risk. Using this to reset you Pi can result in SDcard corruption !! All calculations are off the top of my head, and could be wrong. It relies on the GPIO pin on the watchdog ‘floating high’ while it is an input – it really should be set as an output (HIGH) at startup. I’ve not tested what happens when the watchdog Pi reboots – there’s a chance (likelihood?) that it will reboot the target Pi. EDIT: I have tested what happens when the watchdog Pi reboots and, for me, it does not reboot the target Pi – however there is a chance (likelihood ?) that it will reboot the target Pi. Anyway – enjoy, and let me know if you found it useful…. So for the past few weeks, on and off, I have been focusing on hardware – building a magnificent flying machine – a quadcopter. The only bits missing were batteries (I bought 2 x 3s LiPo and a charger) and the remote controller (I bought a FlySky TH9x and receiver). A few sundries were also needed – a little buzzer, some cable ties, tape, soldering etc. After taking delivery of the various bits, I put the quadcopter kit together in a couple of hours, and I’ve been noodling around for the past couple of weeks with getting the right settings and configuration sorted out on both the Flight Controller (FC) and the Transmitter. Then I headed to the ‘Receiver Tests’ menu in the FC and using the stick trims to make sure all settings were trimmed to 0, and when I moved the sticks the correct values were displayed on the FC. Make sure you have programmed your ESCs – you can do all 4 at once by removing power from the ESC, making sure your throttle is at maximum and all ESCs are plugged into the right connector then while holding down buttons 1 and 4 reapply the power. You should see the display saying ‘Throttle passthrough’, wait for the beeps and move the throttle to minimum then let go of the buttons, you should hear more beeps and your ESCs should be calibrated. The litmus test for me is arming the unit, giving it a little throttle so the props spin and then holding it in my hand. Dip each of the motors and make sure it speeds up and the quad tries to level itself, then hold it level it again and make sure the motor slows again. I find this test, as well as giving it a bit more throttle and making sure it tries to lift as a great indicator that everything is set up correctly. When that’s all working correctly, you know your quadcopter is ready for flight. Outside, open space, little or no wind, time for the first flight – give it throttle, have the quadcopter lift then reduce throttle and let it land. Now the basics are out the way time to test out the maneuverability and do the PID tuning etc to get smoother flying. Next up is attaching a camera – maybe a Raspberry Pi with a USB camera, or an unused smartphone. The first part of this ‘getting things up and running’ series can be found here. In this post I wanted to outline what was required to set up Wi-Fi and to get a Microsoft LifeCam 6000 working, providing a web page with the camera image streaming. So, Wi-Fi… I bought a £6.99 USB Wi-Fi dongle from eBay. After plugging it in and rebooting the Pi I opened a SSH session to it and typed ‘lsusb’ This lists all the usb devices, and I could see the Wi-Fi adapter in the list as a Ralink RT5370. First thing was to get the drivers – doing an ‘apt-cache search ralink’ found me the correct package (firmware-ralink). On issuing ‘apt-get install firmware-ralink’ it told me that the version I had already up to date – great it seems the Raspbian ‘Wheezy’ image comes with it installed. Change "iface wlan0 inet dhcp" to "iface wlan0 inet static"
You should now have a Wi-Fi enabled Pi. For the webcam, things were a little trickier… A lot of people are using ‘motion’ for setting up security cameras, as it does motion detection and can spit out images or movies when some motion is detected as well as do time-lapse and provide a web based video stream for viewing in a browser. However, this was overkill for what I had in mind (just simple streaming of the video), and it also uses a lot of horsepower. So instead I selected mjpg-streamer, an open source project hosted on SourceForge. At this point I tried to do a ‘make’ but it failed stating it could not find linux/videodev.h. A bit of noodling around found that I had a videodev2.h file, so all that was needed was a symbollic link. I did get a few error towards the end, but the key elements built correctly (I think it was just a plugin or two that failed to build, so I simple glossed over that). .. and the final part is of course viewing your handiwork – so open a browser and type :8080">http://<your_pi_ipaddress>:8080 and you should be able to see the webcam image. I now have my second helping of Pi – again I got a Raspberry Pi Model B (512MB RAM) . I’m running this mostly headless and wanted to post a few pointers on my setup (so I can recall it when I trash the Raspbian OS and have to restart from scratch. 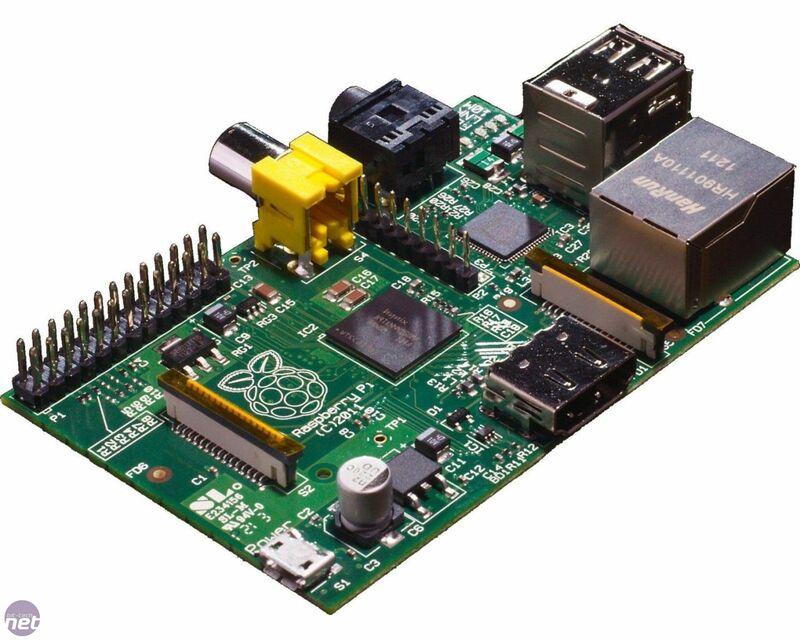 I eventually got round to ordering a Raspberry Pi Model B (512MB RAM) . As you probably know this is a £25 ($35) computer running a 700MHz ARM processor and capable of decoding displaying HiDef 1080p video. I got one to experiment with as a media player for daughter #1 room, so she could watch the videos / DVDs I’ve ripped to the home server. It took around 30 minutes to realise exactly how easy this would be and how powerful these little babies are. I wont go into detail, but to get XBMC running on it is a case of downloading the SD card image, writing to the card, plugging it all in and off you go. Testing it on my main TV, I found that I could even control XBMC from the TV remote (CEC over HDMI) – however on daughter #1 TV that didn’t work so I bought one of these remotes : GMYLE® Windows 7 Vista XP Media Center MCE PC Remote Control and Infrared Receiver for Home, Premium and Ultimate Edition : plugged in the IR Receiver and it all worked seamlessly – amazing ‘out of the box’ experience. This post is an update to my previous one about the CurrentCost Energy Monitor and the software I built for it. After posting brief details about it, I agreed with the guys over at the MSDN Coding for Fun site to write a full project article for them. The suggested a couple of changes – using the Managed Extension Framework (MEF) stuff available in .NET 4 and a Windows Phone 7 client, to make it more generally appealing. I had not seen the MEF stuff before, but it turned out great – very simple framework that allows a full ‘plugin’ style architecture in around 10 lines of code. I also had little experience with the Xaml stuff required for WinPhone 7 apps, but it is actually pretty simple. I have also had submissions from a couple of other developers, one for a plugin that posts to Google PowerMeter and another that records the readings in a database – both of these will be uploaded to the Codeplex site when I have them integrated into the source and working correctly. Anyway, you can read all about it here. There is also a Codeplex site for all the source code and binaries. Post in the comments if you have suggestions for other plugins or features, or want to get involved. I bought one of these about 4 years ago – initially loved it, but it chewed through batteries at an incredible rate, so after a few months of use and another instance of needing fresh batteries (and none being available) it sat in a drawer for some (considerable) time. She’s right (of course) so I dug it out and brought it back into play – reprogrammed the devices for the new HD TV and DVD player, it still had the Pace Twin PVR programmed and bingo it worked again. I wanted to be 100% sure it would do everything I needed (I guess I was looking for an excuse to buy a Harmony), so I looked at all the functions available and programmed – I found that the PVR button (which should bring up the recording library) didn’t work correctly, but a bit of googling sorted that (Key Reprogramming – code 00536) and then I started considering the Xbox. There is a little info around about getting a Kameleon working with your Xbox. I tried this advice for the 8060 (6 in 1), but it didn’t work (apparently the 4 in 1 does not have the modem programing capability), so eventually I emailed One For All support. A pretty quick response indicated that yes it could support the Xbox, but would need sending back for reprogramming (at a cost of £10, as I was outside the first year of purchase / warranty). This seemed like a fair price so I have just sent it off. I’ll post on the ‘richness’ of the Xbox support (and the best code) when I get it back. Anyway, one of the first tasks was networking it -linking it to the home PC and DSL router. I read a bunch of stuff online about the Xbox wireless adapter being over the top and the same could be done with any old wireless router that you had lying around around – so, having an old WRT54G lying around that was my first step. This worked fine initially, I could connect to Xbox Live and the like, but where it fell down was on the connection to the Media Centre PC – for some reason any Media Centre PC must be on the same segment as the Xbox (which is not the case here as Xbox = 192,168.2.x and MCPC = 192.168.1.x). It does this to make ‘discovery’ of the MCPC easy fro an Xbox, but I am surprised (read disappointed) that there is not an advanced / manual setting that allows the user to specify the IP address. I reckon this is around needing a good quality network connection between the devices (which is generally the case if they are on the same subnet, but not always when on different subnet’s), but a simple disclaimer could have sufficed…. It forces users into either running an Ethernet cable, buying a wireless adapter or living without media centre capability. One of the things I find really helpful in terms of motivation (for running) is having easy visibility of weekly, monthly and total mileages, times, paces etc. So, a couple of weeks ago I bought myself a Nike+ Sportband. This promised it all – a senor that fits in your shoe and automatically records your distance, time and speed and wirelessly transmits it to a wristband. The wristband also has a detachable USB connector / screen that you simply plug into your PC and the data is auto uploaded to the Nike+ web site. How wrong I was. I cannot tell you (although that is exactly what this post is trying to do) how technically inept this product is, not just the wristband but also the web site, the whole experience in fact. If you are familiar with the class book ‘Code Complete’ you will know about a ‘Coding Horror’ (things you really should not do when writing software), Jeff Atwood even used the term for the name of his great blog – well this isn’t all software, so lets call them ‘Design Horrors’. The first ‘Design Horror’ comes from trying to invent a new and snazzy way to secure a piece of technology to your wrist. Watch straps have been around for hundreds of years, everyone knows how to use it right ?, the only advancement in wrist fastening / securing technology ever was to use a Velcro patch to secure the two separate lengths of strap together (typically in sports pieces, for added speed). Did this stop the Nike engineers, no way – they came up with a new paradigm in wrist strap technology. One length of strap has 10 small holes, spaced by about 2 or 3 mm, the other length has two stud like protrusions that (using one hand) you must line up with the required two holes and push into place with a force just less than that required to push your thumb through the flesh of your wrist. ‘Design Horror’ 2 (DH2) is similar to that of DH1, remember the detachable USB connector / screen thing I mentioned, well to secure it the USB connector pushing into a slot in the wristband and then it is secured by one of these studs pressed into a hole, however the button on the face of the screen is exactly above that stud and pushing the USB thingy down to make sure it is secured typically results in the button being forcibly pressed for a few seconds (resulting in the device trying to locate the shoe sensor), also I’m not comfortable with the amount of pressure placed upon the button this regularly (thumb through the wrist pressure)…. ‘Design Horror’ 3 (DH3) is the ‘clock’ facility of the wristband. I may be being unfair here, this could be a ‘by design’ issue that was never part of the requirements (which would make it a Product Requirements Horror instead). The wristband has the ability to display the current time, as well as the mileages, pace etc. Naturally you would think that Nike position it as a watch replacement for runners, however I cannot believe that is the case. how could they imagine it would replace my watch which not only has alarms, date functions, countdown timers etc with something that only shows the time, nothing else, and does so without any form of backlighting, so that trying to read it outside the core hours of 10am to 4pm result in a painful headache and a trip to the optician for thick lenses. Obviously the decision to save what couldn’t be more than 10p, for a tiny surface mount device giving date/time features, in the cost of materials seemed important to them. ‘Design Horror’ 4 (DH4) is the orientation of the display. This is in the most difficult to read position available (regardless of how the thing is worn). The display does not read along the length/drop of your arm like most watches – no, it reads perpendicular to the length/drop of your arm. So, now, instead of just squinting at the display with no backlighting you are also skewing your arm / wrist into some crazy angle like a contortionist. What part of “we’ll show a username that the user knows is not theirs and give them no visible means of changing it” seemed sensible at the design stage ?? ‘Design Horror’ 6 (DH6) falls into the areas of calibration and uploading runs. You can see from the screen shot that there is a calibration tab (the sensor is basically a pedometer and it needs to be calibrated to your stride length for accuracy) – the problem is that as soon as the USB thingy is plugged in the Nike+ utility starts and uploads any outstanding runs, before you calibrate. So my very first experience with this, when I’m still in the ‘happy’ zone about my purchase is a run being uploaded that is the wrong distance. All the shiny graphics depict that I am considerably slower and run shorter distances than I actually do – what a deflation. of course, my first though is that I’ll just edit the run and update it with the correct distance – leading me nicely to DH7. ‘Design Horror’ 8 (DH8) is the communication between the wristband and the Nike+ web site – it seems to be one way, certainly none of the totals from the web site are reflected in the wristband figures – I ‘reset’ my wristband the other day to recalibrate (the distances suggested by the unit were 1.05 miles in 8 out, even after calibration) and now it tells me my total is 1.93 miles (even though I calibrated it to 2 miles exactly). The final ‘Design Horror’ (DH9) is the accuracy of the data. The run depicted in the image was an 8 miler I did, steady pace, no walking, flat terrain and a fast finish. the data does not reflect that, it looks like I actually stopped around 2.5 miles and slowed at the end. Nice graphs are great, but if I don’t trust your data then what’s the point. The whole web site is flash/shockwave based and pretty slow, it is also difficult to navigate and non intuitive. On the flip side, it is a great idea, some of the web site features are really neat – the ability to challenge other runners, join ‘virtual teams’ and have team challenges – it’s a pretty good social networking for runners site all in all. It only costs £40 for the kit (sensor and wristband), so it doesn’t break the bank. BUT – It could be incredible if the hardware and software are sorted out !! 3MP Camera plus another low spec camera on the front ! I have it set up for Exchange 2003 SP2 Direct Push email and I actually get the mails on my device a few seconds before they appear on my laptop (cached mode…). The GPS is really good – it comes with TomTom and the ability to download one city (I chose London). I upgraded to all of UK. Start the TomTom application, it takes over the whole screen (including tool/task bars) and gives a very good 3D (or optional 2D) view of the surroundings. Route planning is very simple, mostly I enter the postcode and it finds an accurate match. I hooked it up to a universal mobile phone windscreen mount and am using it all the time. With the Vodafone retail package you also get Spb GPRS Monitor which allows you to see how much data you are passing, allows charting of your usage by day, month, hour etc and allows you to set your tariff and get warned when you get to X% of your daily / monthly allowance. So far even with my busy push email stuff going on I’m only at around 1MB per day. Agile Messenger – this is a pretty neat IM client that handles MSN, ICQ, AIM, Yahoo, Google Talk and others. There is a 7 day free trial and after that costs $44.95 to register ( a bit costly). Actually I don’t see myself using this, instead I’m going for Windows Live Messenger for Mobile, this is actually a web app (so no install) but covers everything I need. The only bummer is that I have not yet been able to add a URL shortcut to my HTC Home Launcher plugin. Diarist 2 – a freeware offline blogging client. Works with many services, and in particular dasBlog, so how could I resist. Also supports newMediaObject, so I can embed images etc no problem. Kaiser Tweak – freeware application (manual install on the PDA) that tweaks a range of options on the Kaiser device – probably no use on other devices ? MoDaCo NoData – another freeware utility, this allows you to turn off GPRS / data completely. Good for when travelling abroad and not wanting to get stung for ridiculous roaming data costs. Google Maps for Mobile – not really used this in anger, not much need when I have TomTom already. The data requirements of this is pretty large but it is displayed to you as you use the application. Couple of things I’m planning on doing with this, the first is auto sending the GPS coordinates to a web service at regular intervals (every 5 minutes for example) – this is so that I can let people see where I am (obviously secured so that I can gives links to certain people only). The other thing is getting a PocketIE URL into the HTC launcher screen- this normally only takes applications so it may require a small app that simply opens PocketIE and navigates to the chosen URL. I have not made much use of the keyboard yet, mostly entered text via the stylus and onscreen keyboard. After a couple of days on connecting to wireless access points (to save on the GPRS usage) I have now turned off the wireless feature, much easier to use GPRS/3G and the bandwidth used is not excessive.